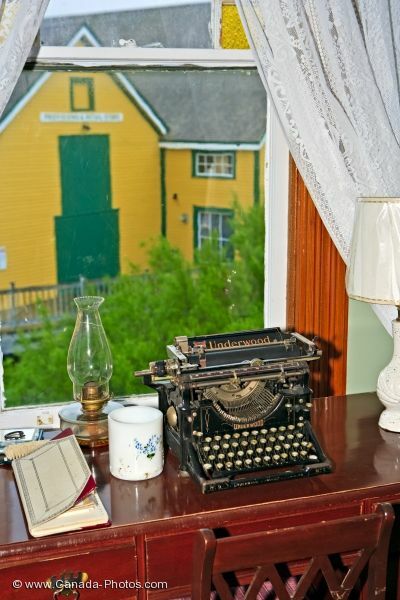 The guest bedroom window at the Alpaheus Barbour House at the Barbour Living Heritage Village in Newfoundland, Canada is adorned with an antique typewriter, lantern and a view of another historic building. When touring the Alphaeus Barbour House at the Barbour Living Heritage Village in Newfoundland, Canada, the guest bedroom window looks out over a yellow and green building. On a table inside the window, there is an antique typewriter, an old lantern, a date book and a coffee mug, the perfect set up for guests who needed to write a letter or get some work done. The Alphaeus Barbour House was constructed in 1904 but it was not completed until 1907 for one of the Barbour's grandsons. A three-storey wooden house designed in a Queen Anne Revival style has bay windows, a tower on the corner sections and floral glass works. In 1993, the house became under the ownership of the Cape Freels Heritage Trust, Inc. and is registered as a heritage structure. Picture of an antique typewriter in a window at the Barbour Living Heritage Village in Newfoundland. When visiting the Barbour Living Heritage Village, one can relive the days when the distinguished Barbour family resided here and spent their time sealing and fishing in both Newfoundland and Labrador. There is a restaurant in the village which makes delicious meals and a gift shop for browsing or to find the exact souvenir one may be looking for. To get to the Barbour Living Heritage Village, one must travel to Newtown, a small town situated on a point of land encompassed by harbors and channels. Looking out the guest bedroom window over an old style typewriter at the Alphaeus Barbour House at the Barbour Living Heritage Village, Newtown, Bonavista Bay, Highway 330, Road to the Shore, Newfoundland, Newfoundland Labrador, Canada.